St. Patrick's Day is Ireland's national day and is celebrated on 17th March each year. The event has grown into a worldwide commemoration of the dispersion and influence of Irish people globally, with parades and marches taking place in towns and cities across the world. In Ireland, St. Patrick's Day is a public holiday and is also often celebrated with local parades and marches. 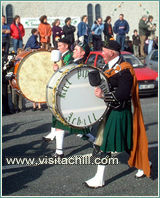 On Achill the St. Patrick's Day parades are focussed around the many pipe bands in the locality. Achill has a long tradition of pipe bands, with several village bands having been established for over 50 years. St. Patrick's Day has traditionally been the highlight of the year for Achill's pipe bands, and they provide a colourful and dramatic focal point for St. Patrick's Day celebrations on Achill Island and the Curraun Peninsula. Beginning with a reveille at dawn, the pipe bands on Achill will march and play for most of the day - resting at intervals for refreshments. For some bands, the walking only ends at sunset. This schedule allows visitors and spectators to join the bands for a while and then to enjoy Achill's other attractions - for the active visitor these include watersports, golf or hillwalking, while for the more relaxed visitor there are always the restaurants and bars to enjoy. Achill offers a traditional, relaxing and unforgettable celebration of St. Patrick's Day, Ireland's national day.